Yesterday I showed you a pic but didn't explain what was happening, so we'll start there again. In this photo I have gently heated the end of the rod ready to apply it to the mendrel which I am holding in the other hand. 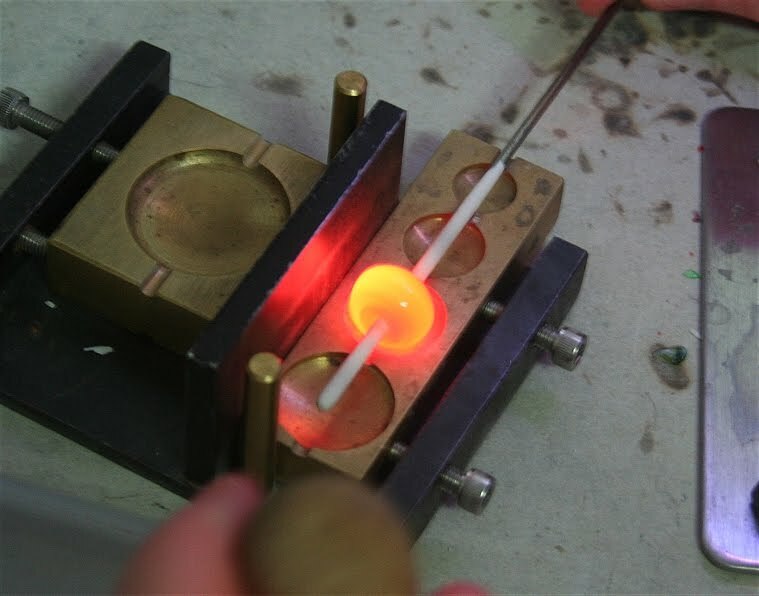 The mandrel (with the bead release on the end) is heated in the flame until it is glowing orange (like the end of the glass rod) & then the end of the rod is touched to the heated mandrel & I start to wind the molten glass on. 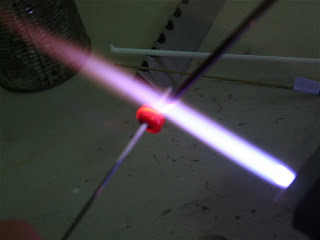 This next picture shows me winding the glass around the mandrel, each time you complete a wrap around the mandrel the bead gets bigger, obviously! This pic was taken on about the third wrap, the glass on the mendrel is called the gather. 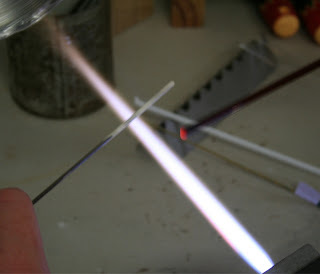 So, you continue to add glass to the mandrel until you get to the size you want. 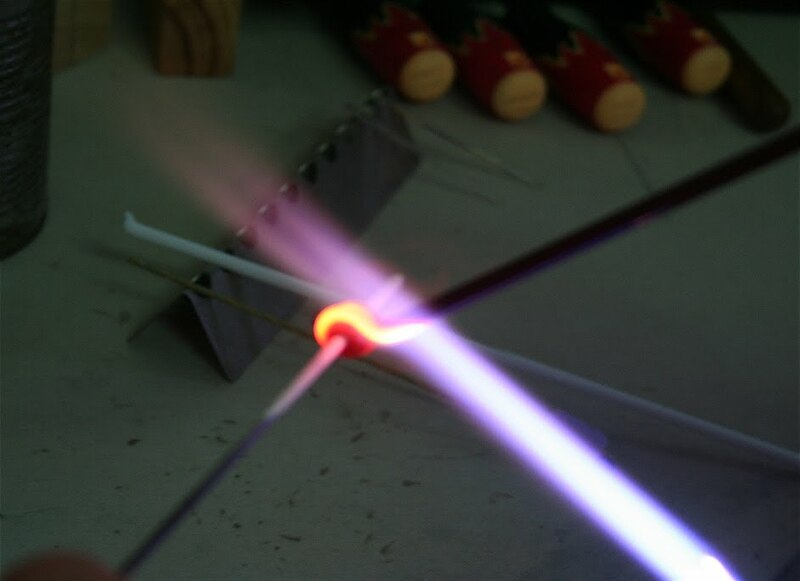 All the time you need to keep rotating the mandrel which is what shapes the bead - if you stop turning, your molten glass will end up on the table or the floor (or if you're really unlucky, your lap - which is not good! LOL). Here I have the size gather that I want, so now I am shaping it by using heat & gravity. Glass tends to always want to round out so you can get a donut shape or a round shape fairly easily. You may have noticed that I have swapped hands, lots of people are ambidexterous & can work with the mandrel in the left hand but I'm not one of them! So I swap my mandrel to the other hand as soon as I have wound on enough glass. I'm still rotating the mandrel around & around. And lastly, I am going to press the gather to make a button bead. The top of the press looks identical to the bottom part, except that it has a handle, unfortuunately it's not easy to get a pic of the glass when there is a brass press on top of it, this was taken just before I put the top on the press. 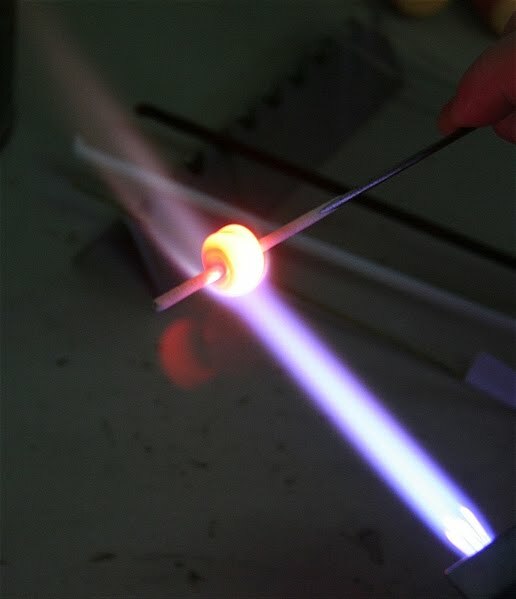 Hope you've enjoyed today's foray into the field of molten glass, next time we'll talk about pressing & annealing the beads. As Penny said Robyn, a video would be lovely. I am fascinated by the art of glass bead making. One step ahead of you girls, I already have a video recorded, I just need to edit it a bit, keep an eye out for it, it will becoming up soon :) .